No time to focus on fitness right now? These simple health hacks take a minute or less. Did you know that fewer than 5 percent of adults clock in the recommended 30 minutes of physical activity each day? In fact, recent reports project that by the year 2039, half of all adults in the United States will be obese. And this is certainly the time of year when even those of us who normally work out regularly find it hard to squeeze in fitness (and keep the pounds off). Over the holidays people say they’re much more likely to behave in more sedentary ways like watching TV, sleeping, eating and drinking to manage their stress. And, according to a poll by the American Psychological Association, up to 69 percent of people are stressed by the feeling of having a “lack of time” to get everything done during the holiday season. If you’re one of those people who feels their blood pressure rise just looking at your to-do list, you may have already decided to shelve any health goals until the new year. But it is possible to begin making positive health changes — and get a jump-start on those resolutions — without having to scrounge for extra time in your schedule. With so much going on this month, now’s not the time to make sweeping changes to your health routine. But by making some small adjustments you can still feel healthier, which helps to encourage you to make other healthy choices along the way. Plus you’re be working to offset the holiday cheer that is to blame for seasonal weight gain. Whether the holidays leave you pressed for time, or you’re just looking for ways to kick your workout routine up a notch, we’ve got you covered with simple health hacks that only take a minute or less. According to the American Council on Exercise, people should consider varying their exercise routines not only to prevent boredom, but also to avoid reaching a plateau in performance and results. If you’ve tried on a holiday dress and noticed your arms are less toned than you’d like, a simple change in grip on your dumbbells can tweak the major muscles involved in each move and expedite your results. For example, if you’re used to doing a bicep curl with your palms holding onto the weights, with the weights parallel to the floor, you can change it up with this quick hack: Turn the dumbbells so that the head of the dumbbell is facing up, so as you curl up, you’ll be practically hitting your shoulder with the head of the weight (and performing a hammer curl). In other words, by holding onto the dumbbells and turning your wrists towards each other (instead of facing up towards the ceiling) you’ll change the angle of the bicep curl and engage different muscles. This can be done for side extensions, overhead presses, and more arm exercises. For side extensions, simply turn the palms face up instead of face down while holding the dumbbells, and you’ll get a completely different arm workout! The scenario is a common one: When you first started your workout routine you saw results that you were happy with. But now, after a few weeks or months, you’re not seeing results even though you’re performing the same moves. Reverse engineering to the rescue! This tactic is another way to avoid plateauing and keep your body guessing without having to develop a whole new training routine. Simply do your same workout routine backwards. For example, let’s take a mini workout. If you’re used to doing squats, bicep curls, then push-ups, reverse the order! Start with push-ups, then bicep curls, and then end with squats. By making your body guess which moves are coming next, you’re incorporating more interval training and helping to build more muscle. Instead of standing around for 60 seconds waiting for the water to get warm before you step into the shower, do squats! Even though standing does burn more calories than sitting, strength training and exercise burns even more. And your opportunities to squeeze in one minute of exercise doesn’t stop at the shower —waiting for water to boil on the stove, folding laundry or peeling vegetables all provide the perfect opportunity to drop into a squat, do some leg lifts or even a one-minute plank. Over the course of the day those bursts of activity can add up to a solid workout. Stress is at an all-time high over the holidays, when busy schedules, end-of-year work deadlines, family dynamics and financial concerns take a toll on our mental health. And meditation is proven to help reduce those sky-high stress levels — and the health risks that come with them. Whether you’re a meditation skeptic or feel like you don’t have the time, turn your post-workout stretch routine into a meditation by simply focusing on your breathing while stretching. Close your eyes during your stretches. Breathe in through your nose and out through your mouth, slowing down your heart rate and focusing on how your body feels in this calming state. And an added bonus? Research has shown that people who practice mindfulness experienced significant weight loss. 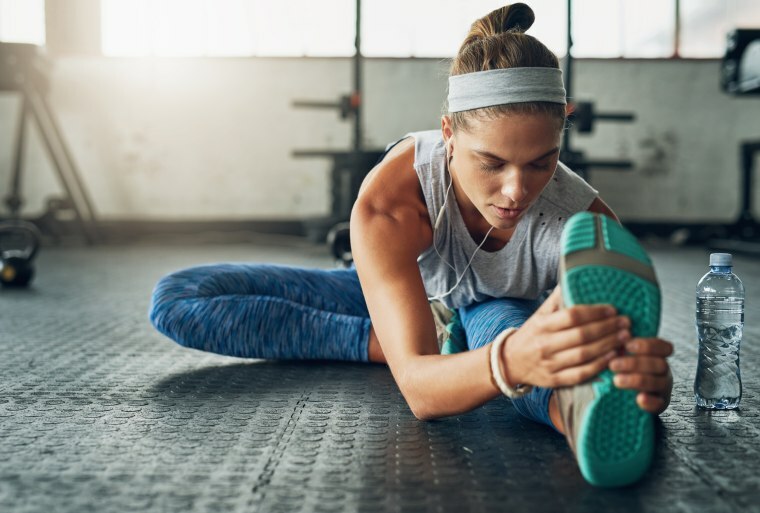 So if that’s one of your fitness goals, becoming more mindful through meditating during your post-workout stretches may help you attain it faster. Studies show that doing cardio in short, 60-second bursts helps improve cardiovascular fitness and can help in burning fat. Do you give your body a rest after a set, check your phone or walk over to the water fountain? Instead, add in a one-minute burst of cardio between each weightlifting exercise, whether it be jogging in place, high knees or jumping rope. Studies show that doing cardio in short, 60-second bursts helps improve cardiovascular fitness and can help in burning fat. Plus, you’re squeezing cardio into your existing routine, without having to schedule in extra time at the gym. This may just be the easiest change you can make to your daily routine. Of course you should be hydrating before and after a workout, but add an extra glass to your morning routine as well. By simply grabbing a glass of water first thing in morning, you’ll be adding 8-12 ounces to your tally right off the bat and you’ll be starting your day on a healthy note, which can have a ripple effect, prompting a series of healthy choices to follow. Not to mention that research shows that staying hydrated helps with fat and weight loss, and overall health. According to the Natural Hydration Council, "dehydration can reduce our ability to concentrate, our cognitive and physical performance, and increase feelings of aggression or irritation" (which is already at an all-time high thanks to traffic jams, mile-long lines at the mall and having to spend extra quality time with your in-laws). And even mild dehydration can affect our mood and energy levels. So if nothing else, staying hydrated can help keep you energized and calm as you power through your holiday to-do list.